An article by Mike McCarthy in the 3 August 1974 issue of Motor magazine described two Triumph prototypes then in private ownership. One, variously named TRX or Bullet, was a bulky two-seater tourer of 1950 aimed exclusively at the US market. It appeared to be a near doppelganger of the Austin A90 Atlantic, and seemed every bit as undesirable. Far more intriguing was the Fury prototype, dating from 1965. 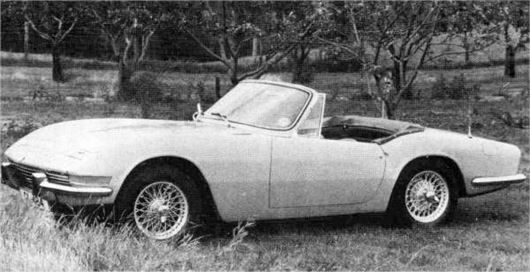 McCarthy speculates as to the intent behind this graceful Michelotti-styled two-seater sports car superficially resembling a larger Spitfire. The prototype appears remarkably well resolved and production-ready – unlikely either to be a motor show concept car or a development hack. The drivetrain and chassis components are significant. Built in the same year that the TR4A was launched, the prototype uses the 2000’s six-cylinder engine and MacPherson strut front and trailing arm rear suspension in a monocoque bodyshell, a first for a Triumph sports car. Other noteable features were pop-up headlights and a dashboard design perfectly redolent of Canley products of the era. The author makes mention of drawings of a Fury with a V8 engine, presumably a slant four derivative, and, perhaps more intriguingly, notes that Macpherson struts were under consideration for the rear as well as the front suspension. The only credible explanation for the emergence of the Fury is that Triumph management realised, even in 1965, that the separate chassis TR, even in its evolved form, was far too blunt an instrument to remain competitive in the United States market into the late-1960s. Given that even the TR4 was still underpinned by a considerable amount of Phase 1 Vanguard hardware, the opportunity to rationalise components with the then-current saloon range must have been attractive. With its very characteristic mid-sixties Triumph detailing the Fury prototype pictured conveys the superficial impression of being a ‘Big Spitfire’, – the chosen name reinforces this idea. However in 1965, it could as readily be seen as a scaled down E-type, with a far broader potential appeal than the rather agricultural TR4. It is worth noting the intensity of activity in the sector at the time, as British, Italian German, and Japanese manufacturers launched new products in pursuit of American sports car buyers’ dollars. 1965 was the launch year for the Alfa Romeo Duetto, Fiat’s 124 Spider and Dino would follow a year later and the Porsche 911 was already well established. The quantity in which the Datsun Fairlady was selling in the United States could not be disregarded, but probably was in Coventry. Closer to home it must have been common knowledge that BMC, still a competitor, were developing a six cylinder MGB, and were shortly to cease production of the Austin Healey 3000, the car probably closest to the TR in character, both being invariably described in journalistic cliche as ‘hairy-chested’. The Fiat Dino, in particular, makes an intriguing comparison with the Fury. Although a premium low-volume product making much of its Ferrari designed and built V6, the resemblance of Pininfarina’s spyder to the Triumph prototype is uncanny, underneath similarities continue, with six cylinder engines of the same capacity, and far more sophisticated interiors than the contemporary norm. The Dino 206 had a live rear axle, but the all-round struts of Triumph’s wish list featured on the 1969 246. The voluptuous front and rear wings of either car may have served the practical purpose of accommodating the required strut towers. It seems wholly likely that the Fury fell victim to the ‘make do and mend’ mentality, which contributed to the ultimate demise of most of Leyland’s constituent marques, when it was realised that 1940s components and production machinery had no hope of competing in the second last decade of the twentieth century. The opportunity the Fury project presented to Triumph’s management was to offer a product which could be produced in greater numbers, at lower cost and compete in more lucrative market sectors. The downside was high development and tooling costs in comparison to prolonging the life of the separate chassis TR series. As we now know, Triumph chose the latter alternative. Perhaps in some ways they were vindicated in their decision. In 1968 the TR5 was launched with the 2½ litre fuel injected six-cylinder engine the Fury would almost certainly have used. Only 15 months later it was itself superseded by the TR6, whose Karmann rejuvenated nose and tail concealed mechanicals scarcely changed from its immediate predecessor. The TR6 remained in production up to 1976, and until the TR7 was by far the best selling of the series. Although it has now unquestionably attained iconic status, the TR6 was not the definitive volume-produced sports car of the first half of the 1970s. That car came not from Coventry, UK but from Zama, Japan and mirrored the Fury prototype uncannily in proportions and technical specification. Missing the chance to beat the Datsun 240Z to the market by at least a year can therefore be added to the long list of opportunities missed by our indigenous motor industry. The Triumph Fury now belongs in the JHW Collection.